Six Verdicts of the 6 Nations. France are the champions of this year's tournament, but there's plenty to smile about for others too. 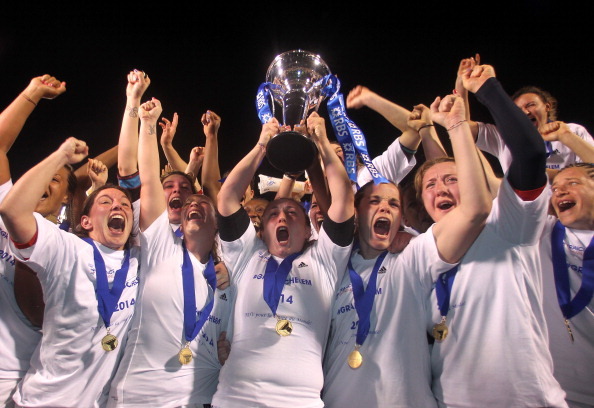 We reflect on the 2014 women's 6 Nations. And throughly deservingly too. Given their performances this season, it seems unfathomable that the French hadn't lifited a title in almost a decade - a fact that highlights England's dominance of the tournament until quite recently. The French pack laid the foundations for a brilliant season that set the pace on the opening day with a superb win over England, and one that didn't let up, even in the face of real grit from Ireland in the final game. While their pack may have grabbed plenty of praise, French backs like Shannon Izar, Marion Lievre and Jennifer Troncy also emerged with massive credit and the French on home soil at the World Cup will be much fancied. Gaelle Mignot has proved herself a worthy leader of this team and with Marie Alice Yahe set to return, the French can call on a highly motivated duo to spearhead the team into the World Cup. By any other standards four wins out of five in the 6 Nations should read as a pretty decent season - but this is the side who has dominated this tournament for an age and since England last won the title in 2012 we are seeing real signs that others have been catching up with their high standards. Nonetheless, the form of players like Emily Scarratt and Rachael Burford in the backs and the return of players like Danielle Waterman and Maggie Alphonsi are well timed and with lots of time together before the World Cup, England will be a much slicker outfit come August. There is still a sense with England that they are finding their momentum again after a disjointed 2013 and when they hit peak form again nobody will fancy playing them. They cannot be faulted for their recovery since losing to France on the opening day and with the extra focus that loss may bring them, they remain among the favourites in Paris. Repeating the heroics of 2013 was always a tough ask with their two most diffiult games away from home and while Ireland came close in Twickenham and in Pau, they ultimately came up short. There is plenty for them to be positive about however as they head to a World Cup in a difficult pool. They have become hugely physical at the breakdown and in Heather O'Brien they have found an able replacement for key retiree Joy Neville. Alison Miller would look at home in any side in the world out wide and they haven't taken too many steps back since last season. With the experience of Lynne Cantwell in the middle of an impressive backline and the progression of players like Claire Molloy and Sophie Spence up front, the Irish should be looking ahead with confidence. Italy's best-ever fourth placed finish was the deserved outcome for a team that is growing in strength and confidence year on year. No longer the tournament's perrenial also-rans, Italy are now targeting a place in the top three - "Our goal should be to catch the teams in the top half " said coach Andrea di Giandomenico in his review of Italy's 2014 campaign. In truth Italy still have a way to go to catch the top three - they failed to score a point against France, Ireland or England - but equally they seem unlikely to be picking up any wooden spoons in the near future. Significant improvements in fitness have ensured that their games are now far closer. Italy now play the full 80 minutes, as Wales discovered. Sara Barattin was the leading scrum-half in the tournament, and the starting point of all of their attacks, while at full-back Manuela Furlan had a terrific tournament, involved in everything. Frustration does seem to be a word that has come up a lot in relation of Wales' 2014 campaign. Their performances looked good in most games, but a combination of a failure to turn opportunites into points, and losses of concentration at crucial times have been their downfall. Catrin Edwards has had a good series in the front row, while teenager centre Robyn Wilkins showed huge promise, starting with a great debut game against Italy and continuing throughout the series - her kicking in particular will prove a real asset to Wales in the future. However the future does look tough- an excellent domestic structure is unearthing talent such as Wilkins, but with opportunities for the national team to play often restricted to the Six Nations (though they have World Cup warm-up games planned) it is going to be hard to keep with the leading teams. The statistics alone are telling. Scotland picked up the wooden spoon for the fourth year running - the worst run in the history of the women's tournament - and have not won a game in the Six Nations since before the last World Cup. This season they did manage to score a try, but they also conceded 256 points - by a significant margin, the largest ever. There were sparks of promise in all games, with Steph Johnson a hugely potent threat on the very rare occasions she got ball in hand in any space, but too often possession would rarely get beyond second phase before breaking down. Performances did improve over the tournament and it is telling that the best was saved until last with a heroic second-half defensive performance that kept out a Welsh team that had gone into the break 25-0 up. Unfortunately that could be their last test match until 2015. Overall Scotland may be improving as a team, but they are not keeping up with the advances of the rest. The small player pool is part of the problem, but without any meaningful playing opportunities outside the Six Nations it is difficult to see how they can begin to catch up.